Written by Camille Langlois on Sep 26, 2017. First of all you’ll need to sit on the floor with your back straight. 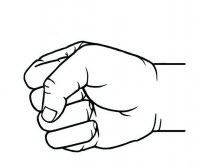 Put your fist on your head in a way that all your fingers touch your head. Measure the height from the top of your fist to the floor. From this measure subtract one (1) inch, this new measure will be the size of your hoop. 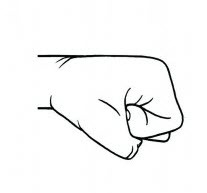 Put your fist on your head in a way that only your little finger touches your head. Measure the height from the top of your fist to the floor. From this measure subtract one (1) inch, this new measure will be the size of your hoop. Over the past 10 years, many people applied another type of measurements. Use the length of you leg( hip to bottom of foot, straight ) as the size of your hoop. Once measured, : Round this number to be the closest to our standard ring sizes 36’’ or 38’’ or 39’’. If your not near any thoses sizes, we can make custom size rings/lyras. Check our Custom Aerial ring. If you buy a hoop TOO BIG: the reach/distance for certain transitions or dynamic skills make them sketchy or impossible. Note: Our hoops are measured across from the inside of the metal to the inside of the metal. While the method described below is for center of metal rod to center of metal rod. Hence why we say to remove ONE inch to the measurement you obtain. Camille is the newbie at CircusConcepts. She is specialized in customer support and manages the website of our shop. Born and raised in Sherbrooke, she is multi-tasked and multi-talented woman who will help you get the best of our products!